Towel-drying your wheels is almost as important as cleaning them! Just like any other surface on your vehicle, wheels are subject to water spots. The bright shine of metal is obscured by cloudy mineral deposits. Water spots are easy to avoid. 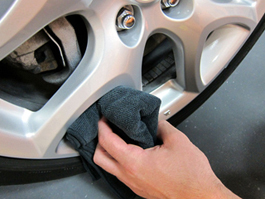 Just use the Microfiber All Purpose & Wheel Detailing Towel to towel-dry your wheels every time you clean them. Wipe away the water droplets and buff wheels to a bright luster. The Microfiber All Purpose & Wheel Detailing Towel is black for two good reasons. First of all, the black microfiber hides stains well. Secondly, the black microfiber enables you to easily designate the Microfiber Wheel Detailing Towel for tires and wheels only. Color-coding your towels and applicators prevents cross-contamination. 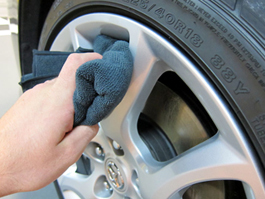 Buffing towels should only be used on paint, glass towels are only for glass, and these handy black towels are only for tires and wheels. 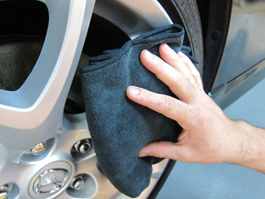 The Microfiber All Purpose & Wheel Detailing Towel grabs residual brake dust. The Microfiber All Purpose & Wheel Detailing Towel is absorbent and soft. It will not scratch any wheel finish, including factory clear coated or paint wheels. The 80/20 blend of polyester and polyamide is extremely tough. Even on the most rugged part of your vehicle, the Microfiber All Purpose & Wheel Detailing Towel holds up through countless uses. Wash your Microfiber All Purpose & Wheel Detailing Towel in Pinnacle Micro Rejuvenator and avoid using bleach or fabric softener. Pinnacle Micro Rejuvenator will clean and degrease the towel, while maintaining its soft texture and magnetic charge. Tumble dry on low heat or no heat. Do not use a dryer sheet.